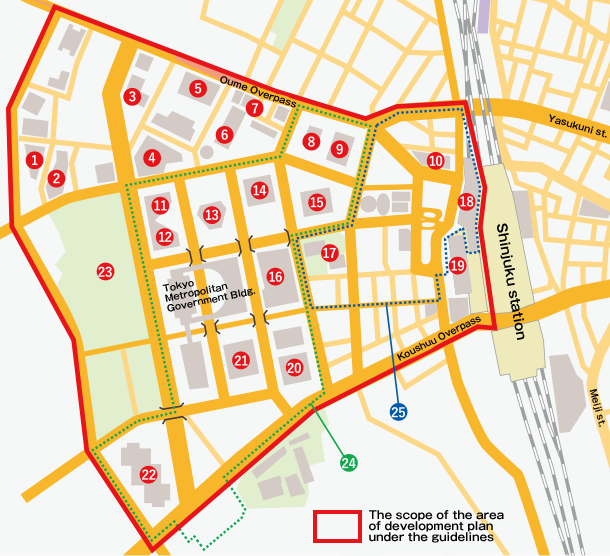 What is the Shinjuku Subcenter Area Environmental Improvement Commission? 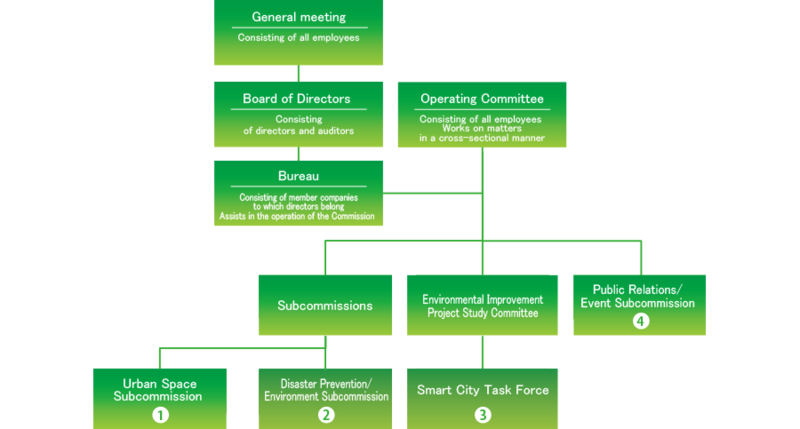 The Shinjuku Subcenter Area Environmental Improvement Commission (hereinafter referred to as “the Commission”) was launched in June 2010 as a private organization consisting of a dozen or so companies. Amid drastic change in the environment surrounding cities, our aim is to solve problems through efforts by the Nishi-Shinjuku area as a whole and boost competitiveness among cities. Since the launch, we have been energetically taking part in activities such as participating at regional councils after being designated as a Special Zone for Asian Headquarters in December 2011. In addition, we marked the start of a whole-area-covered wireless LAN project, the first stage of an environmental improvement effort in June 2012. To promote urban development through public-private partnership (PPP), we inaugurated the Advisory Committee on Development in Nishi-Shinjuku Area with Shinjuku City officials and formulated the "Nishi-Shinjuku Area Urban Development Guidelines" in March 2014. Odakyu Electric Railway Co., Ltd. / Keio Corporation / Parks and Recreation Foundation / Kogakuin University / New Urban Life Holdings Inc. / Sumitomo Realty & Development Co., Ltd. / Sompo Japan Nipponkoa Insurance Inc. / Taisei Corporation / Tokyo Medical University / Tokyo Gas Co., Ltd. / Tokyo Gas Engineering Solutions Corporation / Tokyo Tatemono Co., Ltd. / Urban Renaissance Agency / Nippon Life Insurance Company / Nomura Real Estate Development Co., Ltd. / Mitsui Fudosan Co., Ltd. Launch of the "Shinjuku Subcenter Area Environmental Improvement Commission"
Formulation of the "Area Revitalization Rough Guide Plan"
The Commission formulates and starts implementation of the "Outdoor Advertisement Voluntary Examination Rules"
Strive for realization of affluent spaces through area redevelopment and utilization. To achieve that, the subcommission conducts activities that include developing future visions on urban planning and urban infrastructure, offering suggestions to public administrations, and planning social experiments. Strive for realization of sustainable urban development with a focus on safety, security, low carbonization and coexistence with ecosystems under the theme of DCP (District Continuity Plan) and the way the energy network operates in the Nishi-Shinjuku area. Strive for urban development promotion from a software perspective and area value enhancement through activities including area branding study and provision of information, along with planning events that seamlessly utilize public spaces. To be provisionally established after the adoption of a resolution by the board of directors in order to study environmental improvement projects, which are to be implemented to achieve the Commission's purpose.